We have found THE perfect anchorage! We have about six miles of protective reef in front of us and five lovely pristine islands nearby. There is one wooden thatched-roof shelter on Salurdup in front of us. It seems to be used when ulus bringing tourists from another islands with cabanas for hire for snorkelling and fishing sessions. Otherwise there are only a handful of boats in this enormous anchorage. I LOVE it! 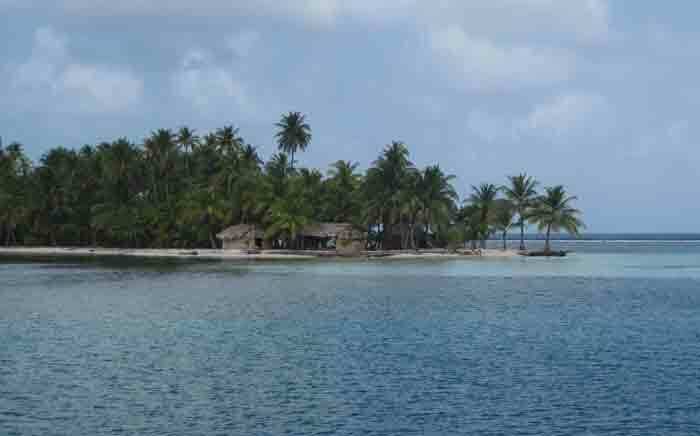 The perfect tropical island- Salurdup in the West Naguarandup Cays! The South Pacific has a high bar to reach! 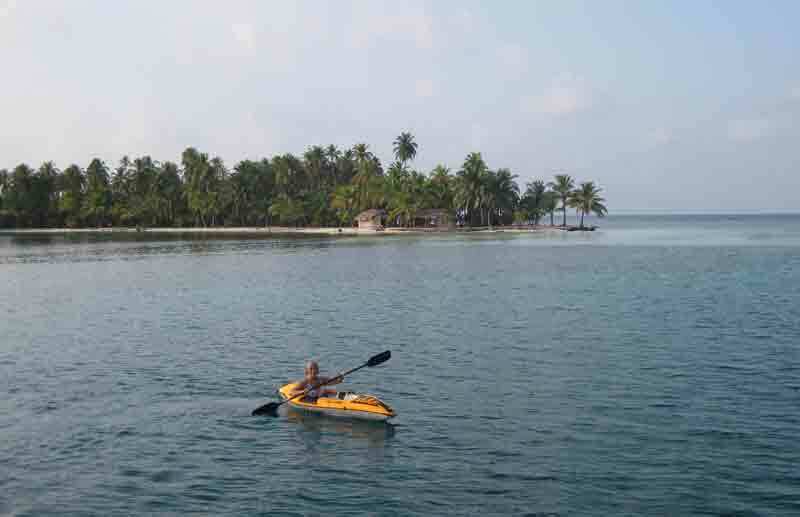 Not only is it beautiful, remote, with open sea in front, there is also terrific snorkelling! The waters are so calm we even managed to get the inflatable kayak into the water and spend a lot of time paddling about. There is an amazing coral reef with a channel out to the outer reef. I actually undertook to exit this channel and swam around the island. Disconcertingly, I met one nurse shark entering as I exited and another halfway around the island, heading in the same direction as the first one. I really didn't want to go back that way and see them again so I continued, all the while trying to find another break in the reef. Unsuccessfully, I'm afraid. Finally, I had to find a shoal with low rock and a little coral and managed to get across, with only a few scrapes. (I would not recommend doing this). I was never so glad to see turtle grass again in my life! Just when everything was copacetic and I was in 18 inches of water, what should I see but ANOTHER nurse shark passing me! From now on I will stick to the safer paths! Kim, Emily and I spent one afternoon swimming out to the outermost islands. It was a spectacular swim. Among other things I found 9 spotted eagle rays and was part of a large school of blue runners and little tunnies. The only other master mola-maker we had heard of was Lisa from Rio Sidra. We had not planned to go there, but were surprised to have a visit from her one morning. Lisa is a well-known transvestite in the area and she does beautiful work. 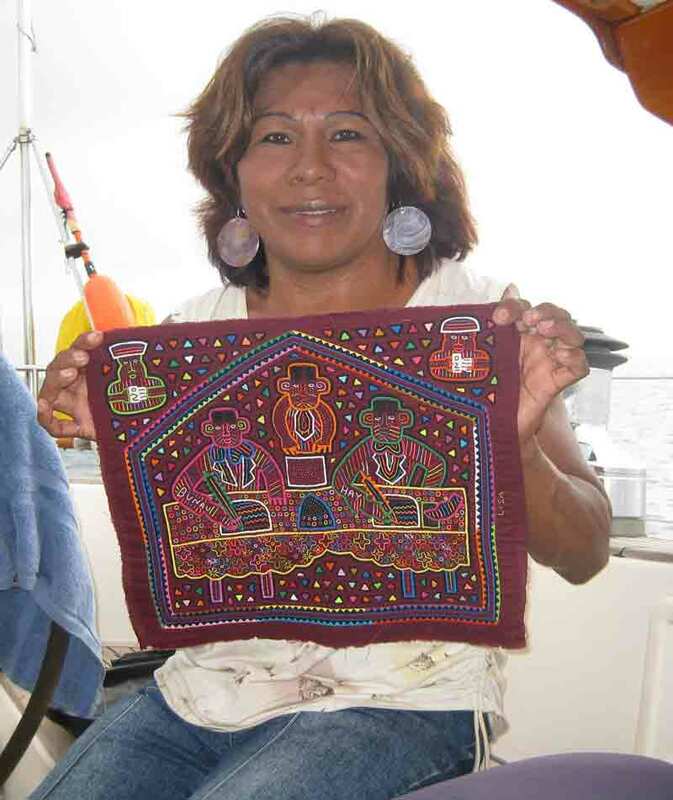 Venancio's molas are spectacular for the fantastic workmanship and their traditional themes and styles. Lisa also does exquisite work and her molas are very imaginative. She has a story to tell about each one. We purchased a lovely mola depicting the congreso with two sahiles inside with an interpreter while outside are representatives of the oppressive police presence in Kuna Yala before the rebellion and independence. This anchorage has everything! Even the veggie boat made a stop here. We also bought lobster and crabs from local fishermen. The smaller lobsters cost $10.00 for 6, the larger ones $8.00 for 4 and the crabs (huge!) $12.00 for four. Much more reasonable than the Mamitupu red snapper!